We are a family that is always on the go, keeping myself & my children hydrated is important, especially when the Texas sun is beating down on us. I try to keep drinks on me or in the car but it doesn't take long for them to get warm & really who wants to take a sip from a warm bottle of water or juice? I was recently introduced to Spark & Spark, I love the selection of personalized gifts that they have to offer for kids as well as adults including wall art, tablet cases, address labels, placesmats & more! I knew Little Sister C would love an adorable pink Thermos, this is perfect for when she gets out of school! Lately she's always hot & sweaty when I pick her up from being outside at recess, I think she'll love sipping on her new Thermos on the way home! I love the fun Thermos designs that are available for boys & girls, while browsing online at Spark & Spark, I decided on the Happy Hearts personalized thermos for Little Sister C! This colorful & exclusive design is personalized with my daughter's name & features a double-wall insulation to keep drinks cold up to 12 hours! The 12 oz Thermos features a stainless steel body, it has BPA-free top & bottom covers as well as a push button lid with a pop-up silicone straw & a flip up carrying loop. This is such an adorable & fun way to keep your child hydrated throughout the year! Who would you like to win a personalized Thermos for? Buy it: Purchase your own Thermos bottle online from Spark & Spark for $39.99! 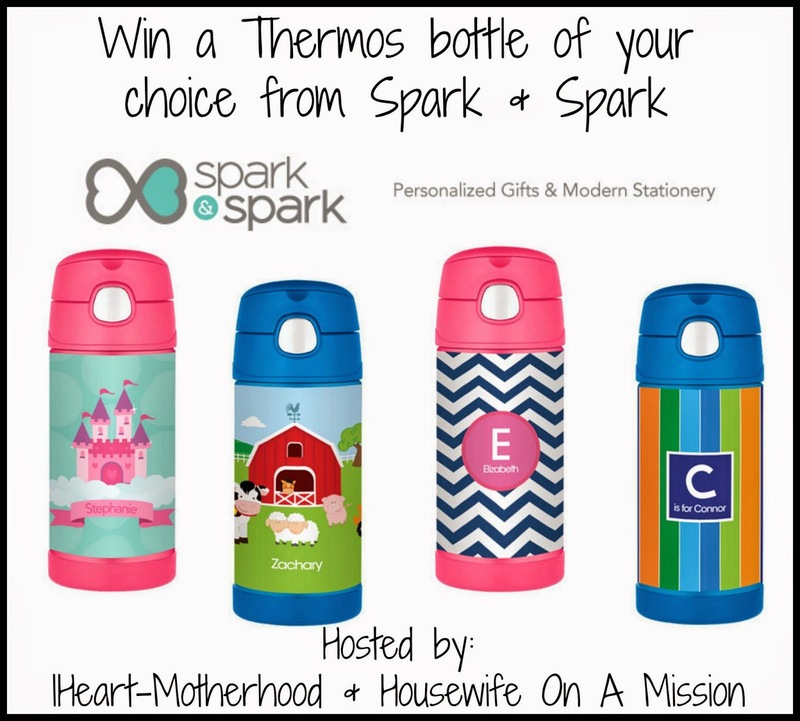 Win it: One lucky reader will win a Thermos bottle, girl & boy designs are available! I like the owl be yours kids plates. I would love a personalized thermos for my son! i like the boxed notecards in cute flower. I would get one of the personalized plates for each of my children!